When your actions speak louder than words, you can accomplish almost anything! But too often I experience people who say they want to stop living paycheck to paycheck but their actions don’t match their words. Telling others you want to lose weight, but exercise and a better diet never seem to happen (at least not for long anyway). You say you’re a believer, but nobody would know it by the way you live your life. You know you need to lay off the ice cream, but you still eat it every night (boy have I been guilty of that one! I paid the price for it too!). 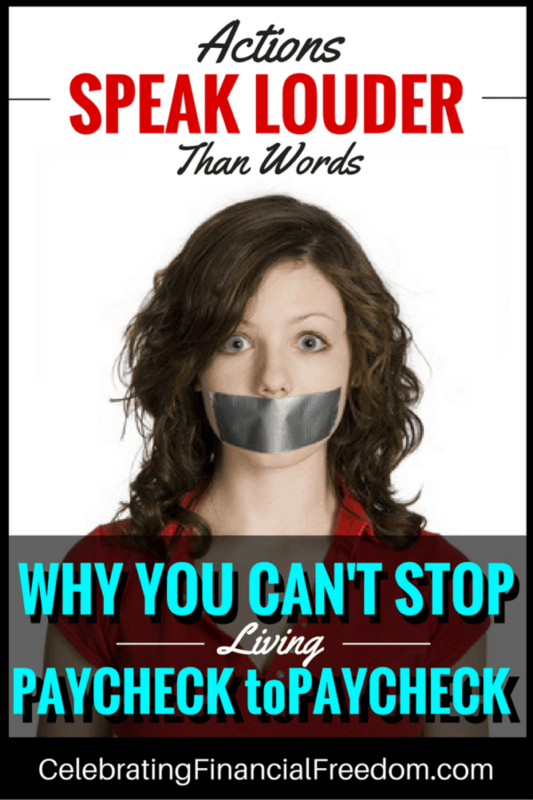 In this article I’ll show you why actions speak louder than words and why that matters for your long term financial health. I’ll also show you how to make your actions and words match so you can get out of debt and leave the paycheck to paycheck life for good! I’ve got some great resources for you at the end too! This is going to get a little deep, so stick with me! The concept that actions speak louder than words is one that for the most part, everyone believes is true but they don’t always put it into practice. When it comes down to it, you can talk all you want about your plans to improve your finances, but it’s only action that gets results! Words (or beliefs) not matching actions is embodied in a concept called cognitive dissonance. To put it simply, cognitive dissonance means your beliefs and your actions aren’t consistent with each other. This creates dissonance, which means disharmony. Have you ever heard two musical tones that don’t go together? The notes compete with each other instead of working together to form a pleasant tone. In fact, it creates a sound that’s downright irritating, sort of like the emergency tone on your TV when there is a weather alert. Dissonance creates stress and imbalance. But when you put the right musical tones together, you create harmony. Matching your words and actions does the same thing. A belief system that says something like getting out of debt is the best thing you can do financially, and actually taking steps to do it creates harmony in your life and finances! A good example of what I’m talking about is a person I know that is constantly struggling financially. This person has talked to me more than once about wanting to get out of debt and get on the right track financially. But when the time comes to actually do something about their finances, they never take action. This person has blown through multiple inheritances. They had to sell their paid for house and take out a loan for a much cheaper condo (and they’re behind on the payments). They constantly get collection calls from companies they owe money to. Their stress level is through the roof, resulting in depression, a poor attitude about life and work, denial, a probable eating disorder, and occasional suicidal thoughts. It’s a disharmony that is wrecking this person’s life, and they’re not willing to do anything about it. They know what they need to do, but continue to make poor decisions that don’t line up with what they know is wise behavior. So when you talk a good game about doing better financially, and you don’t do a budget, still carry a credit card balance, and spend more than you make, that dissonance creates stress in your life as well. Maybe not to the level of my friend above, but stress nonetheless. You believe one thing and do another. And that disharmony creates a continual plague of problems until your actions match what you believe. Limiting beliefs like “the middle class can’t get ahead” and “I don’t make enough money”. It’s hard to form new habits (more about that below). You’re afraid to try something new, even though you know it’ll be for your benefit. But once your actions start matching those noble ideals, you start to experience a harmony that you didn’t know was possible. You’ll feel more at peace with your finances because your words and your actions are in harmony. I can tell you from personal experience that this is true! Once Angie and I got total control over our money, 99% of our money stress (and 100% of our money fights) totally disappeared! So how do you make actions speak louder than words? You have to do the work required to make the two match. So what does the path look like to turn your beliefs from mere words into concrete action? Well, it’s sort of like learning to ride a bike. But as you get more practice, you learn to stay upright and steer your financial bicycle where you want it to go. Pretty soon you’ll be hopping curbs and jumping ramps like Evil Knievel! When what you do starts matching what you say, that’s when you start seeing the results you once only talked about! You’ll finally stop living paycheck to paycheck and get complete control over every dollar! When your actions speak louder than words, you’ll strike a harmonious chord with your money instead of a constant sour note. The cognitive dissonance that’s been plaguing your stress level, your happiness, and your freedom will disappear! Now It’s Time to Get Results! 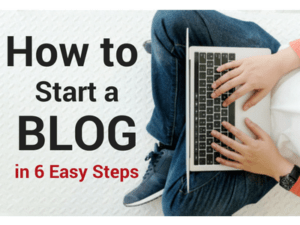 Check out my epic series of posts on every step you need to get out of debt. 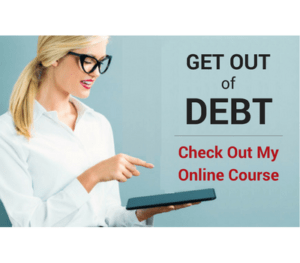 I also have an online get out of debt course available here. 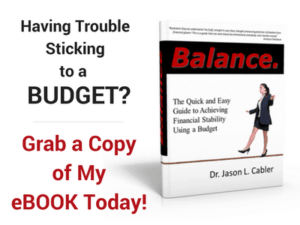 And an awesome book about how to do a budget that actually works. You can learn about changing your mindset and habits with money here. Our incomes have increased such that we are lower middle class and not working poor. We depended on out tax refund for years. The last couple of years, we owed taxes and it was a shock to us. Though we made more money, we couldnt tell. I prayed and yesterday changed my exemption to zero and increased my 401k contribution to 10%. I am proud of myself for taking action. I’m not disciplined enough yet to save the money to pay the it’s directly. That’s great Danel! Taking action is the first step to changing your situation for the better. You’ll really be glad when you see that 401k balance increase every month! I found your suggestion about having an envelope with the budget for each week very helpful. Especially when you said that if the money runs out, you cannot spend anything more that week. I have almost finished my first week and still have money left to buy the rest of this month’s groceries! Thank you for your advice!